Each year more vacationists—sports enthusiasts, lovers of nature, and seekers after the ideal climate—discover the vacation land of their dreams at Deep Creek Lake. Thousands find rest and recreation on the blue waters that nestle among the mountains of Garrett County. Perhaps only hundreds of these visitors realize, though, that they are swimming or fishing or sailing over ground once trod by George Washington and John C. Calhoun. It is true. The waters of this man-made lake sparkle over historic ground. 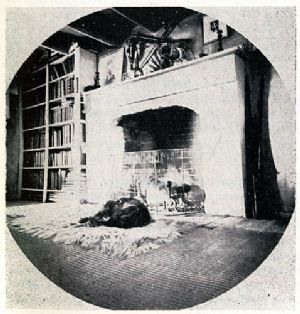 Fireplace in "The Anchorage," the first summer residence on top of the Allegheny Mountains. It was built about 1850 by Roger Perry of Cumberland, Maryland on a tract of land purchased from his brother in law, John Hoye, known as "Peace and Plenty." The house burned down in 1915. The anchors are now in the front yard of one of the tenant houses. They can be viewed from the old Deer Park Road, past the hospital. Picture through the courtesy of Thornton Perry, Charles Town, W. Va., a grandson.